"The audience is like a dog. They can feel immediately that you are afraid, that you are insecure, that you're not in the right state of mind - and they just leave..."
Towards the late 1950s, as abstract art began to lose impetus, many artists across the world began to embrace performance art. 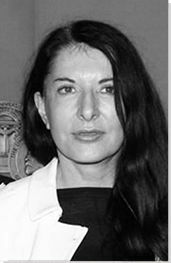 Performance had been a feature of avant-garde art since around 1910, but Marina Abramović's work is typical of the aims of the new generation in her eagerness to avoid traditional, object-based art materials (such as paint and canvas), and to cut down the distance between the artist and the audience by making her own body the medium. Born under Yugoslavia's repressive Communist dictatorship, and raised by parents closely tied to the regime, Abramović's dramatic and dangerous performances often seem like cathartic responses to these early experiences of power. She has produced a quantity of sculpture, but she remains best known for performance, and she remains one of only a handful of performance artists of her generation who have continued to perform late in their career. Marina Abramović's work is typical of the ritualistic strain in 1960s performance art. It often involves putting herself in grave danger and performing lengthy, harmful routines that result in her being cut or burnt, or enduring some privation. She views her art almost as a sacrificial and religious rite, performed by herself for a congregation of viewers. And the physical ordeals she endures form the basis for exploring such themes as trust, endurance, cleansing, exhaustion, and departure. We might interpret her work as having displaced art from traditional media such as painting and sculpture, and moved it directly on to her body. Yet far from conceiving it as simply a surface, she has said that she thinks of the body as the "point of departure for any spiritual development." Between 1976 and 1988 she collaborated with the German-born artist known as Ulay. The performances the pair created during this time often exploited their duality to investigate ideas such as the division between mind and body, nature and culture, active and passive attitudes, and, of course, between male and female. Enduring pain and thriving through it are skills and necessities that root from Abramović’s early years under communist oppression. Interactive chart with Marina Abramović's main influences, and the people and ideas that the artist influenced in turn.